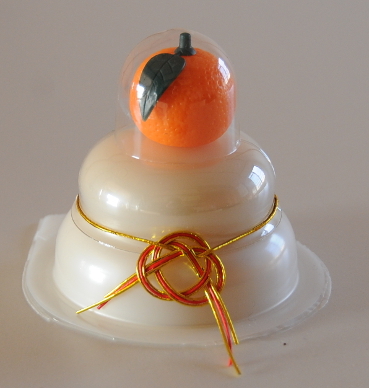 It generally consists of two layers of flattened mochi rice cakes, a Japanese bitter orange called daidai on top, and is decorated at least with a two-coloured bow that is considered lucky. The two mochi pieces are supposed to symbolise the old and new year, the moon and the sun, or yin and yang; whereas the daidai symbolises the continuation of a family from one generation to the next. My friends simply said that the two layers of mochi are meant to double the luck that comes into the household. Kagami mochi are sold at the end of the year and are usually displayed in the household’s shinto altar until January 11th, when they are ritually broken apart in a ceremony called kagami biraki and are eaten. This is meant to ask the gods for good fortune during the coming year. Yes, the mochi are edible and according to my friends you just cut off the hard (and probably dusty) outer part and then fry them and that they are quite tasty – as far as mochi go, I guess. Kagami mochi can have different sizes, the largest ones are usually those placed at the altars of shrines. Mine is a rather small affair, and the daidai on top is made from plastic. As you can see, the whole thing is wrapped in plastic as well, which is a good thing because I placed it near my entrance (I don’t have a shinto altar in my home) and I do indeed intend to try and eat it! With the new year comes a new format for the blog. Since I have started working and am rather busy, I have much less time to go out and have fun with the Japanese and their culture. And I think that writing about my daily routines is quite dull (one reason I never kept a diary), and so is reading about it. So, I will reduce my personal posts to two per week, on Tuesdays and Thursdays. However, I will restart my weekend posts about all things Japanese that are hopefully of more general interest. I hope you’ll keep enjoying the blog! This entry was posted in All Things Japanese, experiences, religious ceremonies by Iris. Bookmark the permalink.